An 8:00 a.m. Mass in St. Mary’s Chapel on December 8 marked the end (but for the inevitable punch list) of a two-year renovation of 98-year-old St. Mary’s Hall and the return of 28 members of the Boston College Jesuit community to refurbished residences on the building’s second, third, and fourth floors. Shortly thereafter, the Woods College of Advancing Studies and the departments of communication and computer science moved into their new quarters in the building’s south wing. With 1,086 students enrolled, economics set a University record for the number of majors. Biology followed with 865, and the mathematics department reported that, since 2000, the number of its majors has increased by 120 percent—to 298—including the addition of 72 this past fall. Work began at 2101 Commonwealth Avenue on the Brighton Campus, former residence of Boston’s Cardinal Archbishop, to create a new venue for the McMullen Museum of Art. The renovations, which will nearly double the current exhibition space, are scheduled for completion in 2016. Andy Hargreaves, the Brennan Professor of Education at the Lynch School of Education, received the 2015 Grawemeyer Award in Education. The $100,000 award, which Hargeaves will share with collaborator Michael Fullan, former dean of the Ontario Institute for Studies in Education, recognized their book Professional Capital: Transforming Teaching in Every School (2012). 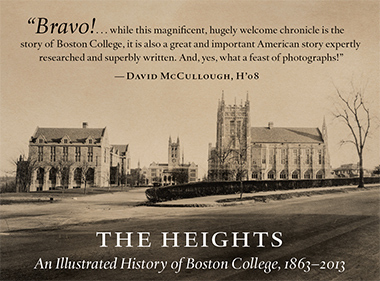 Hargreaves was also acknowledged, along with the Lynch School’s Cawthorne Professor Marilyn Cochran-Smith, in an Education Week ranking of U.S. scholars who are “contributing most substantially to public debates about education.” Six members of the newly installed 114th U.S. Congress are Boston College alumni, while a team of six undergraduates placed third (out of 19) in the regional round of the College Fed Challenge, in which schools present monetary policies for hypothetical implementation by the Federal Reserve Bank to a panel of judges. As part of ongoing renewal of the University’s core curriculum, 15 new freshman classes—among them “Genocide and Crimes Against Humanity,” “Reading the Body,” and “Truth-telling in History”—have been approved for introduction in the fall 2015 semester. Boston College Trustee Karen Izzi Bristing ’84 and her husband Steve Bristing have endowed the head coach’s position for men’s basketball—the Clement and Elizabeth Izzi Family Head Men’s Basketball Coach. The position, currently held by Jim Christian, is the third coaching spot to be endowed. Returning to its original, 1936 moniker, the Graduate School of Social Work changed its title to the Boston College School of Social Work. The Carroll School of Management announced the creation of the Corcoran Center for Real Estate and Urban Action. Named in honor of real estate developer and longtime benefactor Joseph Corcoran ’59, H’09, the center will provide a forum for the study and promotion of mixed-income neighborhoods. The Connell School of Nursing was named a National Hartford Center of Gerontological Nursing Excellence, recognizing CSON’s research, education, and practice in the field. Having led the Eagles to 14 wins in the two years since his arrival in 2013, football coach Steve Addazio’s contract was extended through the 2020 season. A winter storm named Juno dropped more than two feet of snow on campus, canceling classes for two days. Our Sunday Visitor, the largest U.S. Catholic newspaper, named Hosffman Ospino, assistant professor of Hispanic ministry and religious education and author of the 2014 report Hispanic Ministry in Catholic Parishes, one of the “Catholics of 2014.” And professor Juliet Schor topped an About.com list of “5 superstar women sociologists you should know.” The announcement described Schor as the “foremost scholar of the sociology of consumption.” A $7.53 million gift from the Phyllis and Jerome Lyle Rappaport Foundation will establish The Rappaport Center for Law and Public Policy at Boston College and create the Jerome Lyle Rappaport Visiting Professorship in Law and Public Policy. Hoping to clarify the world of carbon atoms for fellow organic chemistry students, five undergraduates have created a website, Orgo Made Simple. Digest notes that simple is a relative term. The Franciscan Hospital for Children, Horace Mann School for the Deaf, Jewish Community Housing for the Elderly, and West End Boys and Girls Club were among a dozen Allston-Brighton groups receiving a total of more than $33,000 in grants from the University’s Allston-Brighton/Boston College Community Fund. During October and November 1,331 faculty and staff members walked or ran 207,768 miles while participating in the University’s wellness campaign, “Walk Across Campus.” The winning team, a 10-person juggernaut from the Connell School of Nursing named CSON Insane, traveled an average of 8.94 miles daily for the period. Top individual honors went to Conte Force team member Stephanie Coleman, who in her non-ambulatory hours is business manager in the student affairs business service center; she kept a 21.34 miles-per-day pace for the two-month period.